The Eternal Temple of Nun™,Inc. 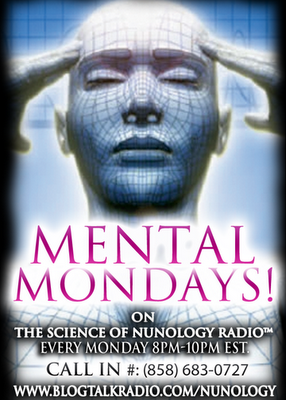 : Tonight on "Mental Mondays!' Allowing "YOUR" Experience! Tonight on "Mental Mondays!' Allowing "YOUR" Experience! IN THIS DAY AND TIME, WHY DO SOME PEOPLE ALLOW THEMSELVES TO FEEL SORRY, PIETY, DEPRESSION, HOPELESS ETC...? IN THIS DAY AND TIME WHY DO SO MANY STILL SUFFER AND NOT ALLOW THEMSELVES TO EXPERIENCE ALL THE FINER THINGS IN LIFE, THAT LIFE TRULY HAS TO OFFER? WELL TUNE INTO TONIGHT'S POWERFUL SHOW HERE AT THE SCIENCE OF NUNOLOGY RADIO AS WE MOTIVATE YOU INTO ALLOWING A NEW EXPERIENCE!